Right, I know everyone is bored of talk about burgers. Hell, I know that I am. 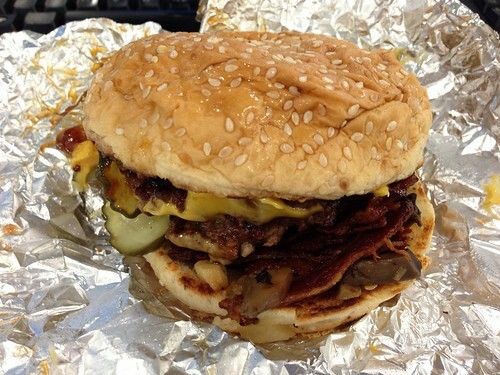 But the truth is, I was just a little bit excited when I heard Five Guys and Shake Shack were both London bound. Two American heavy weights, ready to duke it out on the streets of Covent Garden, one I had heard little of, the other, responsible for one of my food eureka moments. It was going to be pretty interesting how these emotions translated into foodie fact. 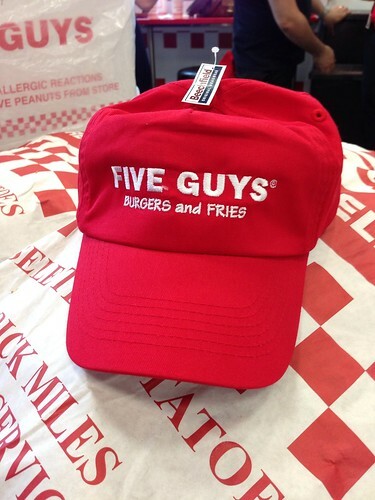 My very own Five Guys hat. Scant reward for rude staff and a ridiculous queuing system. 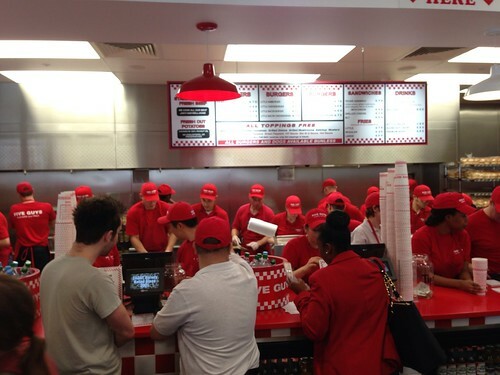 Now, I won't go into the farce of opening day at Five Guys and what madness consumed me to join the queue at lunchtime, but I did and I regret it. The end product, a big greasy mess. Honestly though, it wasn't terrible. I liked the fact that you can pretty much add as many toppings as you want, but with such small patties, overloading these burgers with "stuff" will overpower any beef flavour into oblivion. The fries, nice enough and the cajon seasoning a nice differential, but at over a tenner for a burger and chips, I can't help feeling I'm being just a little bit ripped off. The magic 100 flavour drinks machine is a nice touch and very much a redeeming feature. If you're a soda junkie, come with £2.50 and go wild (a bit like these guys). Getting any type of grape soda is very welcome. 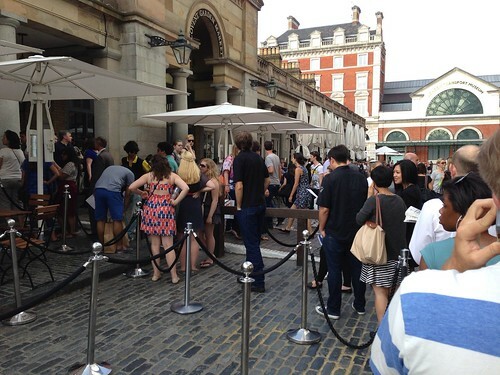 The Queue. Get here before 6:30 and your wait shouldn't be so bad. I remember my first Shake Shack vividly. Waiting just a few minutes in a balmy Madison Square park, hiked back to my cousins flat in the Flat Iron district just a few minutes away and a burger moment at her dining table. This was the way a burger chain was meant to make burgers. Of course, that was a good 5 years ago now, and Londons burger landscape has changed. Swinging by on a Monday at about half 6, there was little to no queue, and a pretty quick twenty minutes later, I was sat in the Piazza with a Shake Burger, cheesy fries and a 50/50 (half ice tea, half lemonade). Now, I'm not going to lie, there was no wow moment. There wasn't even a little woo moment. It was just a pleasant greasy fast food burger. No Hoo's and no Ray's. I went back a few days later with my sister, and opted for a hot dog with a frozen custard. 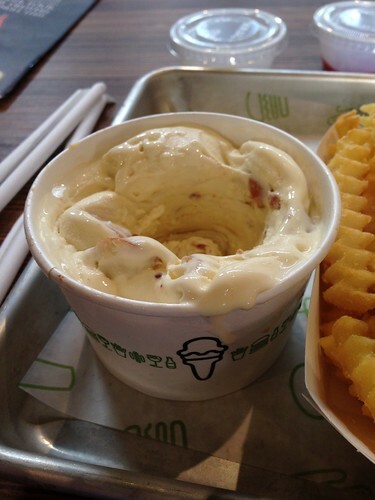 Much better, and if you're talking USP's, the frozen custard is killer and the cheesy crinkle cut fries are great. So there it is, two enjoyable but essentially average and over priced burgers. 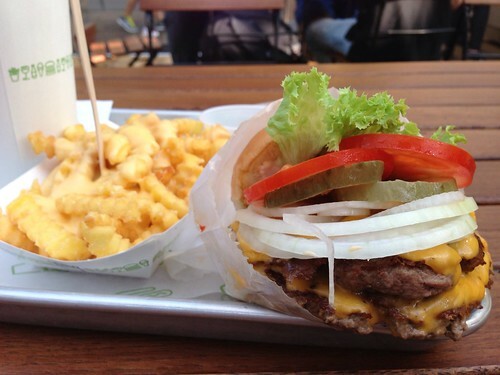 I think us Londoners are pretty blessed when it comes to burgers. The likes of Patty and Bun, Lucky Chip, Honest and Meat Liquor may have taken their influences from the US, but they are very much made in Britain and much the better for it. They may not be everything Americans look for in a burger, but I think are doing a pretty stand up job of satisfying us Brits. I didn't realise Five Guys was so expensive! I've been to Shake Shack in NY so I think I will try it out for nostalgia - the hot dog I had there was great. The concretes look yummy and like that they are using Paul A Young chocolate too. Patty & Bun still wins for my favourite burger in London, will be hard to top the Lambshank Redemption! Baffled by these two being so popular, when every review I've read has been neutral at best to scathing at worst. I've heard good things about Patty and Bun so may try there instead. I think my favourite burger in London so far would have to be Burger Bear - if those guys set up permanent residence somewhere in south London I fear my health will rapidly deteriorate.